The United States Africa Command (USAFRICOM, U.S. AFRICOM, and AFRICOM), is one of ten unified combatant commands of the United States Armed Forces, headquartered at Kelley Barracks, Stuttgart, Germany. It is responsible for U.S. military operations, including fighting regional conflicts and maintaining military relations with 53 African nations. 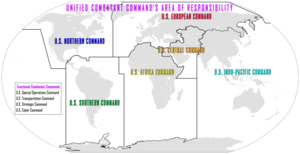 Its area of responsibility covers all of Africa except Egypt, which is within the area of responsibility of the United States Central Command. U.S. AFRICOM headquarters operating budget was $276 million in fiscal year 2012. The Commander of U.S. AFRICOM reports to the Secretary of Defense. In individual countries, U.S. Ambassadors continue to be the primary diplomatic representative for relations with host nations. In 2007, the White House announced, "[AFRICOM] will strengthen our security cooperation with Africa and create new opportunities to bolster the capabilities of our partners in Africa. Africa Command will enhance our efforts to bring peace and security to the people of Africa and promote our common goals of development, health, education, democracy, and economic growth in Africa." General Carter F. Ham said in a 2012 address at Brown University that U.S. strategy for Sub-Saharan Africa is to strengthen democratic institutions and boost broad-based economic growth. Prior to the creation of AFRICOM, responsibility for U.S. military operations in Africa was divided across three unified commands: United States European Command (EUCOM) for West Africa, United States Central Command (CENTCOM) for East Africa, and United States Pacific Command (PACOM) for Indian Ocean waters and islands off the east coast of Africa. A U.S. military officer wrote the first public article calling for the formation of a separate African command in November 2000. Following a 2004 global posture review, the United States Department of Defense began establishing a number of Cooperative Security Locations (CSLs) and Forward Operating Sites (FOSs) across the African continent, through the auspices of EUCOM which had nominal command of West Africa at that time. These locations, along with Camp Lemonnier in Djibouti, would form the basis of AFRICOM facilities on the continent. Areas of military interest to the United States in Africa include the Sahara/Sahel region, over which Joint Task Force Aztec Silence is conducting anti-terrorist operations (Operation Enduring Freedom - Trans Sahara), Djibouti in the Horn of Africa, where Combined Joint Task Force – Horn of Africa is located (overseeing Operation Enduring Freedom - Horn of Africa), and the Gulf of Guinea. The website Magharebia.com was launched by USEUCOM in 2004 to provide news about North Africa in English, French and Arabic. When AFRICOM was created, it took over operation of the website. Information operations of the United States Department of Defense was criticized by the Senate Armed Forces Committee and defunded by Congress in 2011. The site was closed down in February 2015. In 2007, the United States Congress approved $500 million for the Trans-Saharan Counterterrorism Initiative (TSCTI) over six years to support countries involved in counterterrorism against threats of Al Qaeda operating in African countries, primarily Algeria, Chad, Mali, Mauritania, Niger, Senegal, Nigeria, and Morocco. This program builds upon the former Pan Sahel Initiative (PSI), which concluded in December 2004 and focused on weapon and drug trafficking, as well as counterterrorism. Previous U.S. military activities in Sub-Saharan Africa have included Special Forces associated Joint Combined Exchange Training. Letitia Lawson, writing in 2007 for a Center for Contemporary Conflict journal at the Naval Postgraduate School, noted that U.S. policy towards Africa, at least in the medium-term, looks to be largely defined by international terrorism, the increasing importance of African oil to American energy needs, and the dramatic expansion and improvement of Sino-African relations since 2000. In mid-2006, Defense Secretary Donald Rumsfeld formed a planning team to advise on requirements for establishing a new Unified Command for the African continent. In early December, he made his recommendations to President George W. Bush. On 6 February 2007, Defense Secretary Robert Gates announced to the Senate Armed Services Committee that President George W. Bush had given authority to create the new African Command. U.S. Navy Rear Admiral Robert Moeller, the director of the AFRICOM transition team, arrived in Stuttgart, Germany to begin creating the logistical framework for the command. On 28 September, the U.S. Senate confirmed General William E. "Kip" Ward as AFRICOM's first commander and AFRICOM officially became operational as a sub-unified command of EUCOM with a separate headquarters. On 1 October 2008, the command separated from USEUCOM and began operating on its own as a full-fledged combatant command. February 2007 Draft Map of U.S. AFRICOM showing its creation from parts of USEUCOM, USCENTCOM and USINDOPACOM. The U.S. military areas of responsibility involved were transferred from three separate U.S. unified combatant commands. Most of Africa was transferred from the United States European Command with the Horn of Africa and Sudan transferred from the United States Central Command. Responsibility for U.S. military operations in the islands of Madagascar, the Comoros, the Seychelles and Mauritius was transferred from the United States Pacific Command. The AFRICOM headquarters is located at Kelley Barracks, a small urban facility near Stuttgart, Germany, and is staffed by 1,500 personnel. In addition, the command has military and civilian personnel assigned at Camp Lemonnier, Djibouti; RAF Molesworth, United Kingdom; MacDill Air Force Base, Florida; and in Offices of Security Cooperation and Defense Attaché Offices in about 38 African countries. It was reported in June 2007 that African countries were competing to host the headquarters because it would bring money for the recipient country. However, of all the African nations, only Liberia has publicly expressed a willingness to host AFRICOM's headquarters. The U.S. declared in February 2008 that AFRICOM would be headquartered in Stuttgart for the "foreseeable future". In August 2007, Dr. Wafula Okumu, a research fellow at the Institute for Security Studies in South Africa, testified before the United States Congress about the growing resistance and hostility on the African continent. Nigeria announced it will not allow its country to host a base and opposed the creation of a base on the continent. South Africa and Libya also expressed reservations of the establishment of a headquarters in Africa. The Sudan Tribune considered it likely that Ethiopia, a strong U.S. ally in the region, will house USAFRICOM's headquarters due to the collocation of AFRICOM with the African Union's developing peace and security apparatus. Prime Minister Meles Zenawi stated in early November that Ethiopia would be willing to work together closely with USAFRICOM. This was further reinforced when a U.S. Air Force official said on 5 December 2007, that Addis Ababa was likely to be the headquarters. On 18 February 2008, General Ward told an audience at the Royal United Services Institute in London that some portion of that staff headquarters being on the continent at some point in time would be "a positive factor in helping us better deliver programs." General Ward also told the BBC the same day in an interview that there are no definite plans to take the headquarters or a portion of it to any particular location on the continent. President Bush denied that the United States was contemplating the construction of new bases on the African continent. U.S. plans include no large installations such as Camp Bondsteel in Kosovo, but rather a network of "cooperative security locations" at which temporary activities will be conducted. There is one U.S. base on the continent, Camp Lemonnier in Djibouti, with approximately 2,300 troops stationed there having been inherited from USCENTCOM upon standup of the command. In general, U.S. Unified Combatant Commands have an HQ of their own in one location, subordinate service component HQs, sometimes one or two co-located with the main HQ or sometimes spread widely, and a wide range of operating locations, main bases, forward detachments, etc. USAFRICOM initially appears to be considering something slightly different; spreading the actually COCOM HQ over several locations, rather than having the COCOM HQ in one place and the putative "U.S. Army Forces, Africa", its air component, and "U.S. Naval Forces, Africa" in one to four separate locations. AFRICOM will not have the traditional J-type staff divisions,[clarification needed] instead having outreach, plans and programs, knowledge development, operations and logistics, and resources branches. AFRICOM went back to a traditional J-Staff in early 2011 after General Carter Ham took command. U.S. Africa Command completed fiscal year 2010 with approximately 2,000 assigned personnel, which includes military, civilian, contractor, and host nation employees. About 1,500 work at the command’s main headquarters in Stuttgart. Others are assigned to the command’s units in England and Florida, along with security cooperation officers posted at U.S. embassies and diplomatic missions in Africa to coordinate Defense Department programs within the host nation. As of December 2010, the command has five Senior Foreign Service officers in key positions as well as more than 30 personnel from 13 U.S. Government Departments and Agencies serving in leadership, management, and staff positions. Some of the agencies represented are the United States Departments of State, Treasury, and Commerce, United States Agency for International Development, and the United States Coast Guard. U.S. Africa Command has limited assigned forces and relies on the Department of Defense for resources necessary to support its missions. On 1 October 2008, the Seventeenth Air Force was established at Ramstein Air Base, Germany as the United States Air Force component of the Africa Command. Brig. Gen. Tracey Garrett was named as commander of the new USMC component, U.S. Marine Corps Forces Africa (MARFORAF), in November 2008. MARFORAF is a dual-mission arrangement for United States Marine Corps Forces, Europe. On 3 December 2008, the U.S. announced that Army and Navy headquarters units of AFRICOM would be hosted in Italy. The AFRICOM section of the Army’s Southern European Task Force would be located in Vicenza and Naval Forces Europe in Naples would expand to include the Navy's AFRICOM component. Special Operations Command, Africa (SOCAFRICA) is also established, gaining control over Joint Special Operations Task Force-Trans Sahara (JSOTF-TS) and Special Operations Command and Control Element – Horn of Africa (SOCCE-HOA). The U.S. Army has allocated a brigade to the Africa Command. Headquartered on Caserma Ederle in Vicenza, Italy, U.S. Army Africa, in concert with national and international partners, conducts sustained security engagement with African land forces to promote peace, stability, and security in Africa. As directed, it can deploy as a contingency headquarters in support of crisis response. The 2nd Brigade Combat Team, 1st Infantry Division, the "Dagger Brigade", is being aligned with AFRICOM. U.S. Naval Forces Europe - Naval Forces Africa (NAVEUR-NAVAF) area of responsibility (AOR) covers approximately half of the Atlantic Ocean, from the North Pole to Antarctica; as well as the Adriatic, Baltic, Barents, Black, Caspian, Mediterranean and North Seas. NAVEUR-NAVAF covers all of Russia, Europe and nearly the entire continent of Africa. It encompasses 105 countries with a combined population of more than one billion people and includes a landmass extending more than 14 million square miles. The area of responsibility covers more than 20 million square nautical miles of ocean, touches three continents and encompasses more than 67 percent of the Earth's coastline, 30 percent of its landmass, and nearly 40 percent of the world's population. Task Force 60 will normally be the commander of Naval Task Force Europe and Africa. Any naval unit within the USEUCOM or USAFRICOM AOR may be assigned to Task Force 60 as required upon by the Commander of the Sixth Fleet. Air Forces Africa (AFAFRICA) is located at Ramstein Air Base, Germany, and serves as the air and space component to U.S. Africa Command (AFRICOM) located at Stuttgart, Germany. Air Forces Africa shares a headquarters and units with United States Air Forces in Europe, and its component Air Force, 3AF (AFAFRICA) conducts sustained security engagement and operations as directed to promote air safety, security and development on the African continent. Through its Theater Security Cooperation (TSC) events, Air Forces Africa carries out AFRICOM's policy of seeking long-term partnership with the African Union and regional organizations as well as individual nations on the continent. Air Forces Africa works with other U.S. Government agencies, to include the State Department and the U.S. Agency for International Development (USAID), to assist African partners in developing national and regional security institution capabilities that promote security and stability and facilitate development. 3AF succeeds the Seventeenth Air Force by assuming the AFAFRICA mission upon the 17AF's deactivation on 20 April 2012. U.S. Marine Corps Forces, Africa conducts operations, exercises, training, and security cooperation activities throughout the AOR. In 2009, MARFORAF participated in 15 ACOTA missions aimed at improving partners’ capabilities to provide logistical support, employ military police, and exercise command and control over deployed forces. MARFORAF conducted military to military events in 2009 designed to familiarize African partners with nearly every facet of military operations and procedures, including use of unmanned aerial vehicles, tactics, and medical skills. MARFORAF, as the lead component, continues to conduct Exercise AFRICAN LION in Morocco—the largest annual Combined Joint Chiefs of Staff (CJCS) exercise on the African continent—as well as Exercise SHARED ACCORD 10, which was the first CJCS exercise conducted in Mozambique. In 2013, the Special Purpose Marine Air-Ground Task Force - Crisis Response - Africa was formed to provide quick response to American interests in North Africa by flying marines in Bell Boeing V-22 Osprey aircraft from bases in Europe. Special Operations Command Africa was activated on 1 October 2008 and became fully operationally capable on 1 October 2009. SOCAFRICA is a Subordinate-Unified Command of United States Special Operations Command, operationally controlled by U.S. Africa Command, collocated with USAFRICOM at Kelley Barracks, Stuttgart-Möhringen, Germany. Also on 1 October 2008, SOCAFRICA assumed responsibility for the Special Operations Command and Control Element – Horn of Africa, and on 15 May 2009, SOCAFRICA assumed responsibility for Joint Special Operations Task Force Trans – Sahara (JSOTF-TS) – the SOF component of Operation Enduring Freedom – Trans Sahara. SOCAFRICA’s objectives are to build operational capacity, strengthen regional security and capacity initiatives, implement effective communication strategies in support of strategic objectives, and eradicate violent extremist organizations and their supporting networks. SOCAFRICA forces work closely with both U.S. Embassy country teams and African partners, maintaining a small but sustained presence throughout Africa, predominantly in the OEF-TS and CJTF-HOA regions. SOCAFRICA’s persistent SOF presence provides an invaluable resource that furthers USG efforts to combat violent extremist groups and builds partner nation CT capacity. On 8 April 2011, Naval Special Warfare Unit 10, operationally assigned and specifically dedicated for SOCAFRICA missions, was commissioned at Panzer Kaserne, near Stuttgart, Germany. It is administratively assigned to Naval Special Warfare Group 2 on the U.S. East Coast. Commander SOCAFRICA serves as the Special Operations Adviser to Commander, USAFRICOM. Combined Joint Task Force – Horn of Africa (CJTF-HOA) conducts operations in the East Africa region to build partner nation capacity in order to promote regional security and stability, prevent conflict, and protect U.S. and coalition interests. CJTF-HOA's efforts, as part of a comprehensive whole-of-government approach, are aimed at increasing African partner nations' capacity to maintain a stable environment, with an effective government that provides a degree of economic and social advancement for its citizens. Africa Partnership Station is the U.S. Africa Command's primary maritime security engagement program which strengthens maritime security through maritime training with various nations. State Partnership Program connects a U.S. state’s National Guard to an African nation for military training and relationship-building. Operation Odyssey Dawn - Libya, was the first major combat deployment directed by Africa Command. The current State Department Deputy to the Commander for Civil-Military Engagement is Ambassador Alexander Laskaris. ^ a b c d "About the Command". U.S. AFRICOM. Retrieved 24 June 2015. ^ DOD Dictionary of Military and Associated Terms. U.S. Joint Chiefs of Staff - J7, 9999 Joint Staff Pentagon #2D932, Arlington VA 22202: U.S. Department of Defense (DOD) - Joint Chiefs of Staff - J7. August 2017. p. 372. ^ Mueller, Karl P. (8 July 2015). Precision and Purpose: Airpower in the Libyan Civil War. Rand Corporation. p. 83. ISBN 9780833087935. ^ "FACT SHEET: United States Africa Command". U.S. AFRICOM Office of Public Affairs. 15 April 2013. Retrieved 24 June 2015. ^ "President Bush Creates a Department of Defense Unified Combatant Command for Africa". Georgewbush-whitehouse.archives.gov. 6 February 2007. Retrieved 19 May 2011. ^ Waldhauser, General Thomas D. (9 March 2017). United States Africa Command 2017 Posture Statement. U.S. Senate Committee on Armed Services: U.S. Africa Command. p. 7. This article incorporates text from this source, which is in the public domain. ^ "A CINC for Sub-Saharan Africa? Rethinking the Unified Command Plan". Parameters. US Army War College. Winter 2000–01. Archived from the original on 9 November 2017. Retrieved 9 November 2017. ^ Fellows, Catherine (8 August 2005). "US targets Sahara 'terrorist haven'". BBC News. Retrieved 24 June 2015. ^ "About This Site". 22 October 2004. Archived from the original on 4 December 2004. ^ Pincus, Walter (8 May 2015). "U.S. Africa Command Brings New Concerns". Washington Post. Retrieved 25 June 2015. ^ Pincus, Walter (6 December 2011). "A speed bump for Pentagon's information ops". Washington Post. Retrieved 25 June 2015. ^ Mazmanian, Adam (13 February 2015). "DOD shutters two 'influence' websites covering Africa". FCW. Retrieved 25 June 2015. ^ Lobe, Jim (31 January 2007). "POLITICS: Africa to Get Its Own U.S. Military Command". Inter Press Service. Retrieved 24 June 2015. ^ "Operations and Initiatives". EUCOM. Archived from the original on 9 January 2007. Retrieved 6 February 2007. ^ "Pan Sahel Initiative (PSI)". GlobalSecurity.org. Retrieved 24 June 2015. ^ Lawson, Letitia (January 2007). "U.S. Africa Policy Since the Cold War" (PDF). Strategic Insights. Department of National Security Affairs Center on Contemporary Conflict. 6 (1). Retrieved 24 June 2015. ^ Northham, Jackie (7 February 2007). "Pentagon Creates Military Command for Africa". NPR Morning Edition. Retrieved 25 June 2015. ^ Schogol, Jeff (30 December 2006). "Africa Command plans approved by Bush, DOD officials confirm". Stars and Stripes. Retrieved 25 June 2015. ^ Garamone, Jim (6 February 2007). "DoD Establishing U.S. Africa Command". American Forces Press Services. US Department of Defense. Retrieved 25 June 2015. ^ a b Crawley, Vince (6 February 2007). "U.S. Creating New Africa Command To Coordinate Military Efforts". USINFO. US Department of State. Retrieved 25 June 2015. ^ "Africa Command Transition Team leader arrives in Stuttgart". Africa Command Transition Team Public Affairs. USEUCOM. 27 February 2007. Retrieved 25 June 2015. ^ "U.S. Africa Command Reaches Initial Operating Capability". US AFRICOM Public Affairs. 1 October 2007. Retrieved 25 June 2015. ^ Jelinek, Pauline (6 February 2007). "Pentagon setting up new U.S. command to oversee African missions". Independent Record. Associated Press. Retrieved 25 June 2015. ^ "Africa: Testimony of Dr. Wafula Okumu – U.S. House Africom Hearing". Allafrica.com. ^ "US AFRICOM headquarters to remain in Germany for "foreseeable future". International Herald Tribune. 19 February 2008. ^ "US drops Africa military HQ plan". BBC News. 18 February 2008. ^ "US army boss for Africa says no garrisons planned". SudanTribune article. Retrieved 19 May 2011. ^ "Ethiopia ready to cooperate with US Africa Command – Zenawi". SudanTribune article. Retrieved 19 May 2011. ^ Garrett, Brigadier General Tracy L.; Ward, General William E. (14 November 2008). "TRANSCRIPT: Marine Corps Forces, Africa Officially Established". Archived from the original on 20 July 2011. Retrieved 21 November 2008. ^ "U.S. Military Official Pays Courtesy Call" (Press release). The Executive Mansion, The Republic of Liberia. 18 November 2008. Archived from the original on 23 August 2009. Retrieved 21 November 2008. ^ Novak, Lisa M., "Italy To Host AFRICOM Headquarters", Stars and Stripes, 5 December 2008. ^ "Welcome Information – US Army Africa". Usaraf.army.mil. Archived from the original on 18 July 2011. Retrieved 19 May 2011. ^ "Dagger brigade readies for AFRICOM missions". Army.mil. Retrieved 2 March 2013. ^ "Commander, U.S. Naval Forces Europe-Africa/U.S. 6th Fleet". Naveur-navaf.navy.mil. 21 December 2008. Retrieved 19 May 2011. ^ "CNE NAV Left Navigation". Naveur-navaf.navy.mil. 21 December 2008. Retrieved 19 May 2011. ^ "17th Air Force – Home". 17af.usafe.af.mil. Archived from the original on 10 May 2011. Retrieved 19 May 2011. ^ "17th Air Force – Home". Newpreview.afnews.af.mil. Archived from the original on 19 January 2016. Retrieved 19 May 2011. ^ "17th Air Force stands down, AFAFRICA mission carries on". U.S. Air Forces in Europe Public Affairs. Archived from the original on 26 May 2012. Retrieved 1 May 2012. ^ "Mission". Marines.mil. 6 February 2007. Archived from the original on 11 May 2011. Retrieved 19 May 2011. ^ "SP-MAGTF Crisis Response ACE maintains readiness 24/ 7". Marforaf.marines.mil. Retrieved 12 May 2014. ^ "Report" (PDF). Archived from the original (PDF) on 20 July 2011. Retrieved 19 May 2011. ^ "CJTF-HOA Factsheet". Hoa.africom.mil. Archived from the original on 26 April 2009. Retrieved 19 May 2011. ^ Ham, Carter. "STATEMENT: AFRICOM Commander on Commencement of Military Strikes in Libya." AFRICOM, 19 March 2011. ^ "US AFRICOM ends military operation against IS radicals in Libya". Libyan Express. 21 December 2016. Retrieved 30 December 2016. McFate, Sean (January 2008). "US Africa Command: next step or next stumble?". African Affairs. 107 (426): 111–120. doi:10.1093/afraf/adm084. Wikimedia Commons has media related to United States Africa Command. "Advanced Questions for General William E. "Kip" Ward, U.S. Army Nominee for Commander, U.S. Africa Command" (PDF). (165 KB), U.S. Senate Committee on Armed Services testimony. The Americans Have Landed, Esquire, 27 June 2007. Retrieved 2007-08-10. This page was last edited on 7 March 2019, at 03:46 (UTC).